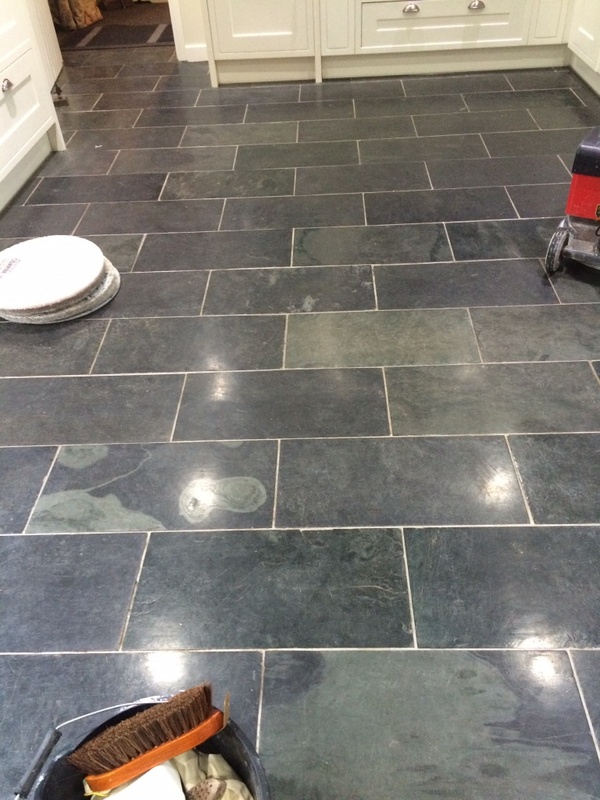 This beautiful Brazilian Slate tiled floor was installed in the kitchen of a house in Barrow-in-Furness, Cumbria; the slate has been previously sealed with a number of products including Varnish and the overall effect was inconsistent making the floor dull and had done little to bring out the true beauty of the natural stone. Additionally varnish is quite brittle and easily scratched by furniture etc. so never a good choice for sealing a floor. 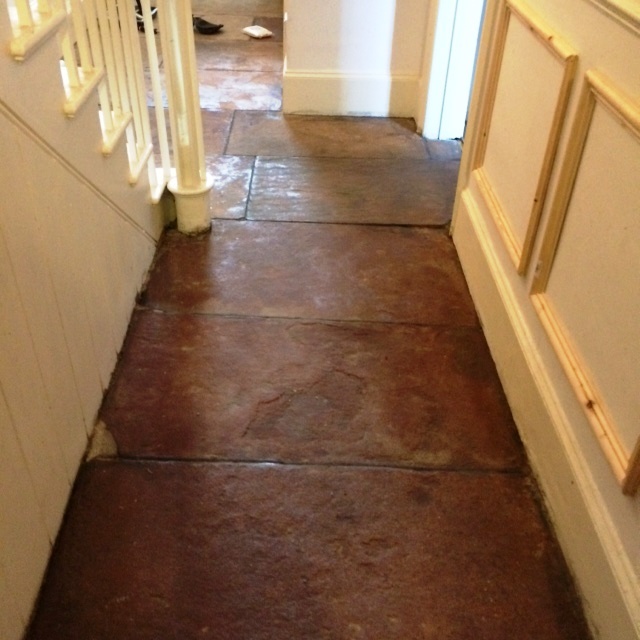 The situation needed to be remedied so during my visit I did a small test to strip off the old sealants, clean the tile and re-seal; the effect was transformational so they booked me to come back in a few weeks’ time to finish the job. 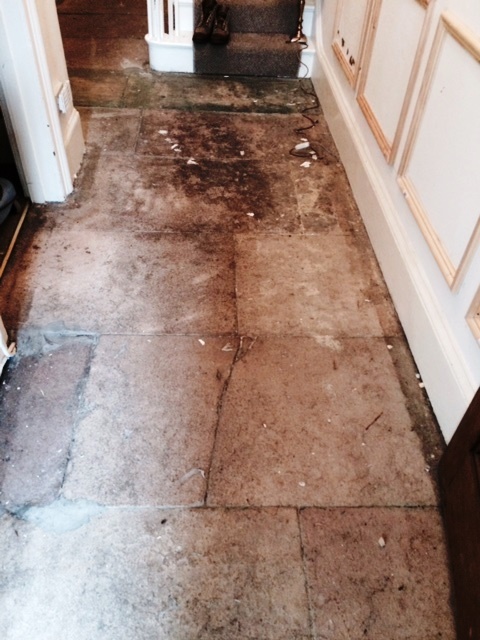 To transform the floor and guarantee the final appearance its necessary to remove all the previous products applied to the floor stripping it back to its natural state and then seal again. 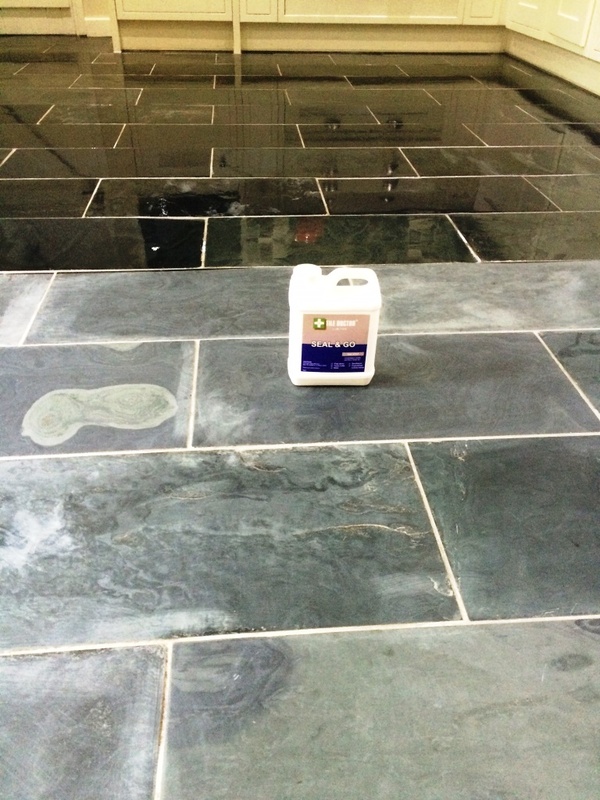 So I got started stripping off the varnish and other sealants from the floor slate using a dilution of Tile Doctor Remove and Go which is a tile friendly product designed to remove coatings from natural stone. The solution is sprayed onto the floor, left to soak in and then agitated using a floor buffer fitted with a black scrubbing pad. The soiled solution is then rinsed away and removed using a wet vacuum. This process removed most but not all of the varnish and sealers so the next step was to apply NanoTech UltraClean which is a gel that you apply and leave for 30 minutes before adding water and agitating with a scrubbing pad. 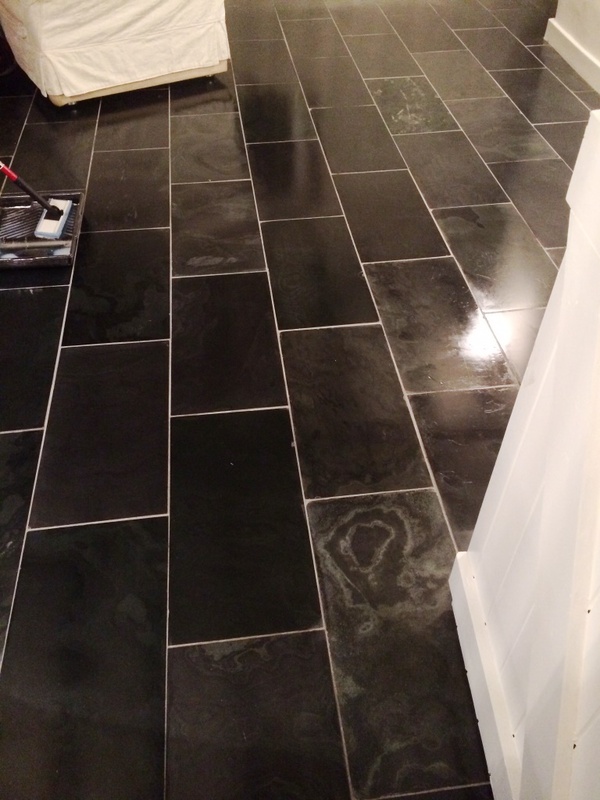 This did the trick and now not only was the slate clean of all coatings the grout had come up nice and clean as well. The whole floor was given a thorough rinse to remove any trace of product and then dried as much as possible using the wet vacuum to soak up the water. The floor was left to dry off overnight and I returned the next day to seal the tiles checking first with a damp meter to ensure they were no longer damp. All was well so I proceeded to apply the sealer with a paint pad applicator. 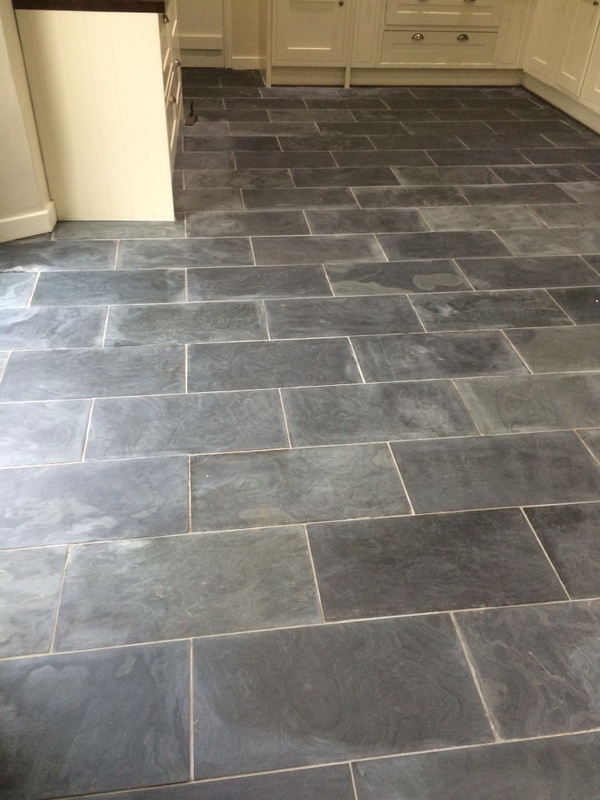 For this we had agreed on Tile Doctor Seal and Go which is ideal for slate as it really does transform the look of slate and adds a nice satin finish, the Slate was quite porous so five coats were needed in total. 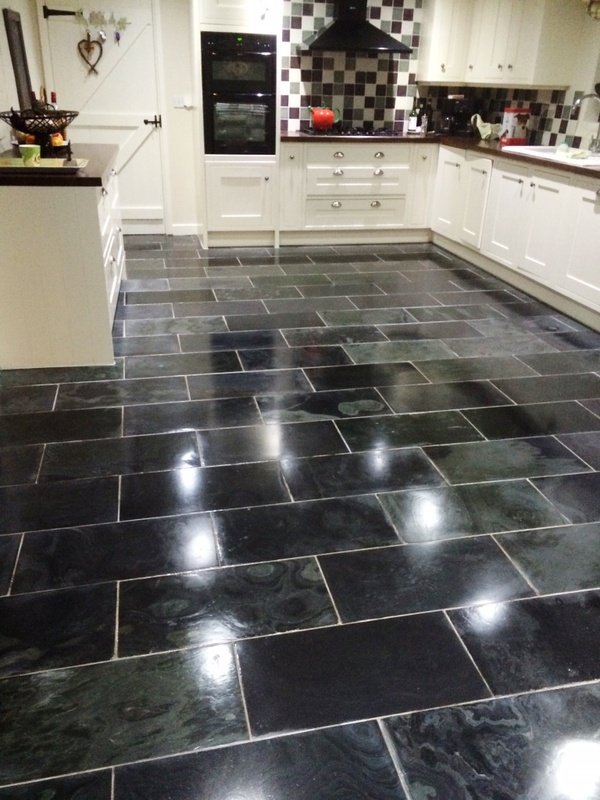 I think you will agree the Brazilian slate tiles look much improved; certainly the customer was happy with the results. Before leaving I gave them some advice about aftercare and what products to use when cleaning the floor in future for best results. 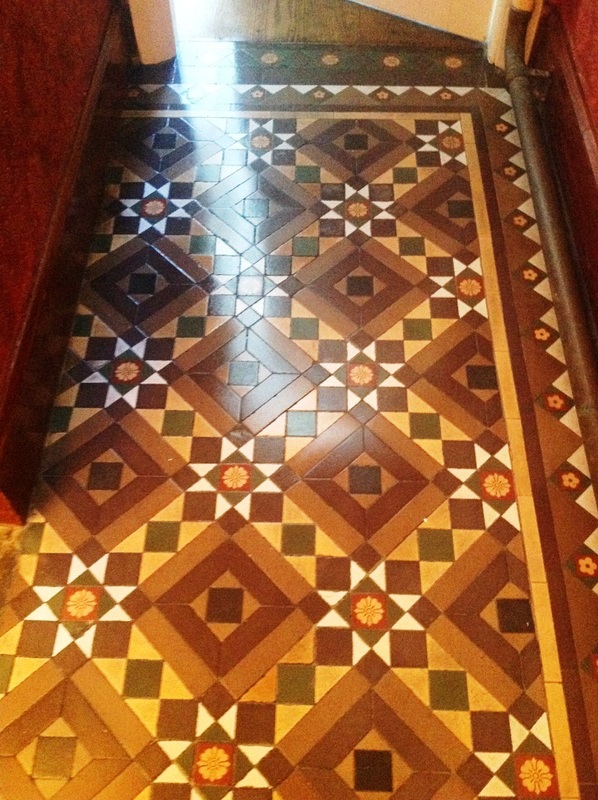 I recently paid a visit to Windermere in the Lake District to clean and re-seal a Victorian Tiled hallway floor. 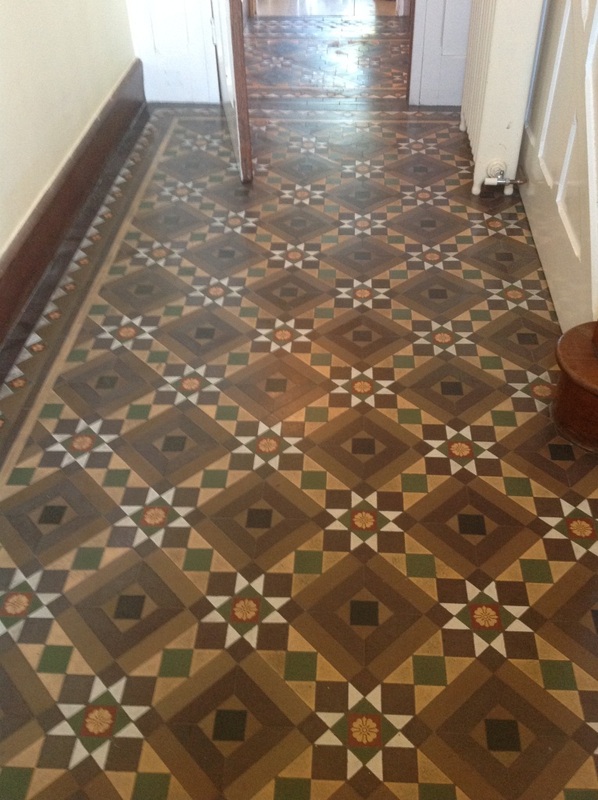 The customer wanted the shine putting back on the Victorian tile and some tile grout had become loose and needed replacing. On arrival I set up my tools and covered any areas that needed protecting against water. Once that was done I started to strip the floor of any remaining sealer using Tile Doctor Remove and Go which is a coatings and sealer remover product that is safe to use on tile, stone and grout. Working in small areas the product was scrubbed into the tile and then washed it off with water using a wet vacuum to remove the soiled solution. This process was repeated until the whole floor was clean, there were a few stubborn areas and for these I mixed the Remove and Go 50/50 with Nano Tech Ultra Clean which adds tiny abrasive particles into the solution to make a more effective product. 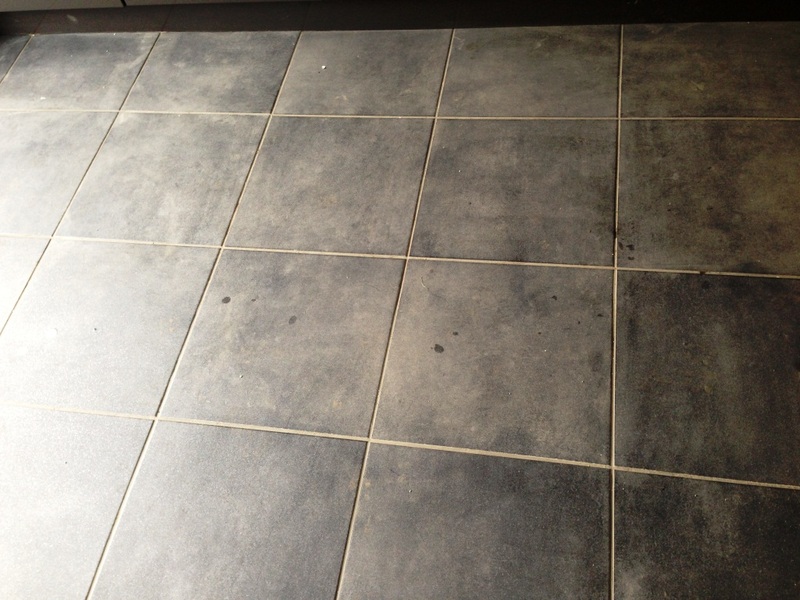 The process of scrubbing the floor made me realise that the loose grout problem was greater than first thought and some tiles need re-laying so I decided to come back and do this the next day, before leaving however I gave the floor a thorough rinse to ensure any trace of cleaning product was removed. The next day I arrived and fixed all the loose tiles, my preference is to use the Mapei range of tile adhesives and grout, in fact the grout comes in a range of colours which is very useful if your filling in holes in travertine etc. One the adhesive had gone off I began to grout them in including those areas where the grout was missing or become loose. The last step was to wash off the grout from the tile surface and making sure it was all tidy for the next day. On the third day I returned to the house and after verifying the floor was dry with a damp tester and the grout had hardened I started sealing the floor with Tile Doctor Seal and Go putting on thin coats which took about twenty minutes to dry, in total seven coats were applied which gave the floor the nice shine the customer was after. This job took me three days in total and after I had finished we discussed how to maintain the appearance and increase the longevity of the sealer by using a Neutral Cleaning product which unlike many acidic cleaners does not eat away at the sealer. 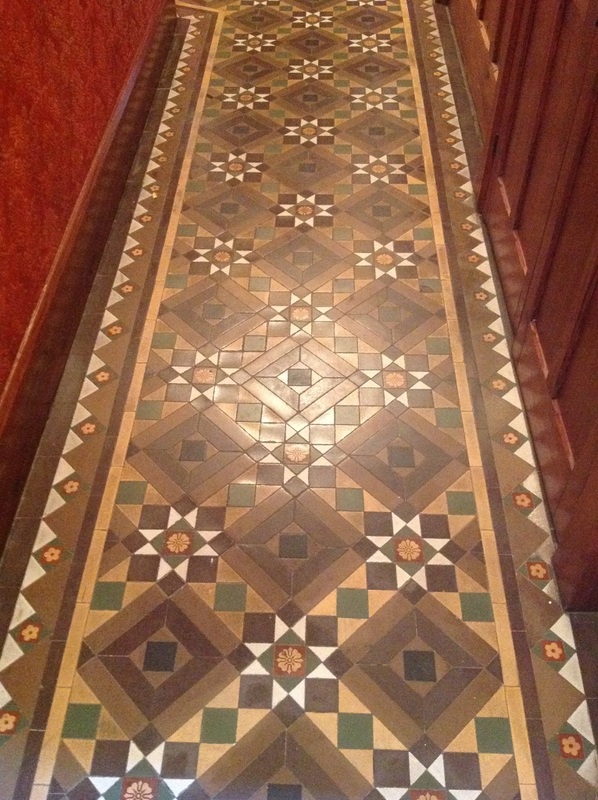 NB..Reproduction Victorian Tiles can be difficult to source so if you’re looking for replacements contact www.KendalTileandStone.co.uk who stock a good range. 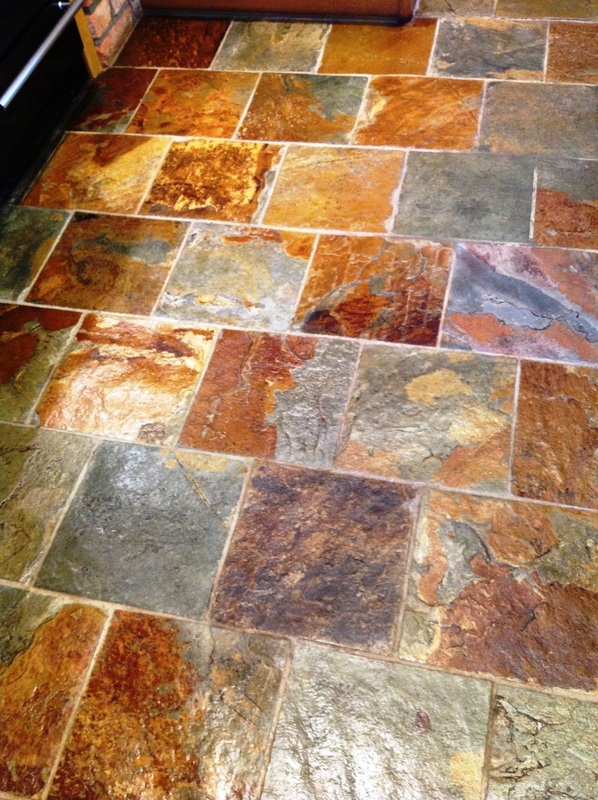 A customer from Kendal (famous for its Kendal Mintcake) called me in to look at their Quarry Tiled Utility floor, which was looking very dirty and stained. 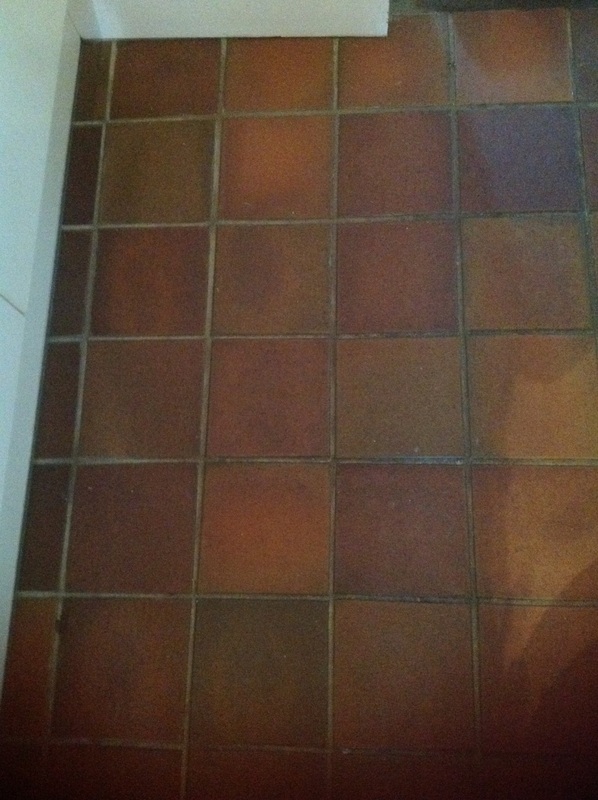 On inspection the sealer had broken down and was no longer protecting the tile resulting in dirt getting ingrained into the pores of the tile resulting in discolouration. We agreed what short of finish was required and the customer booked me in to do the work. 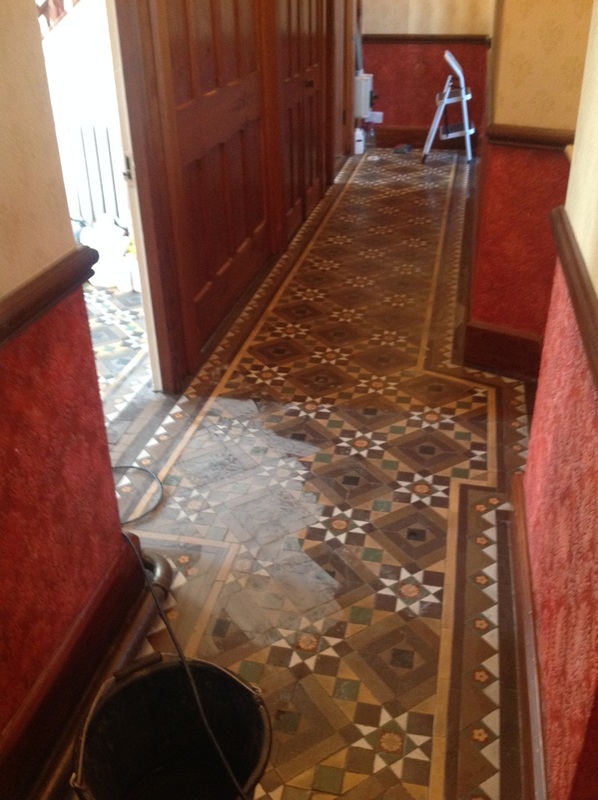 My first job was to protect the surrounding areas from splashes so on my arrival I covered the wooden floor in the hallway before starting to remove the old sealer with Tile Doctor Remove and Go, I sprayed it on working in small areas leaving it to dwell for a while before scrubbing it in with a stiff brush making sure I scrubbed it in well before removing the soiled solution with a wet vacuum. I scrubbed all the grout joints at this point to make sure they were all clean and then washed the floor down to remove any chemical and neutralise the floor. 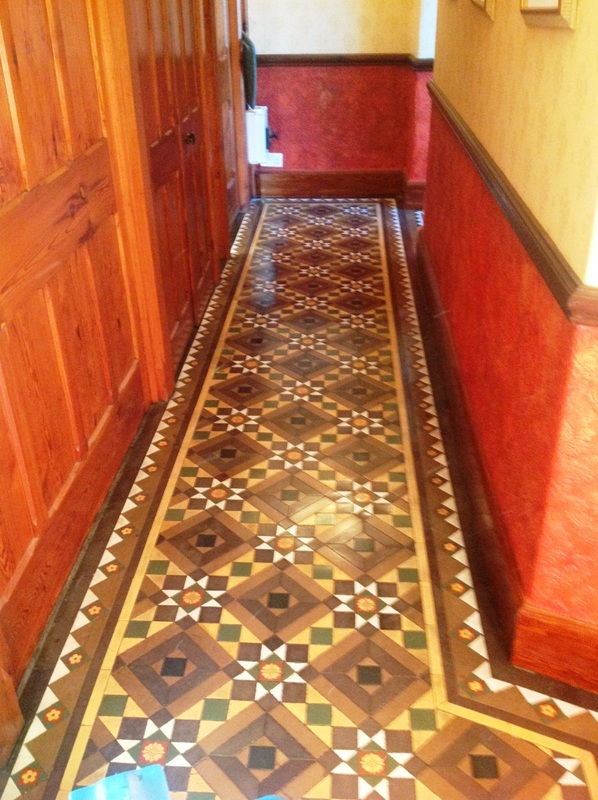 It was a relatively small floor so I left it to dry and returned a few house later to seal it. 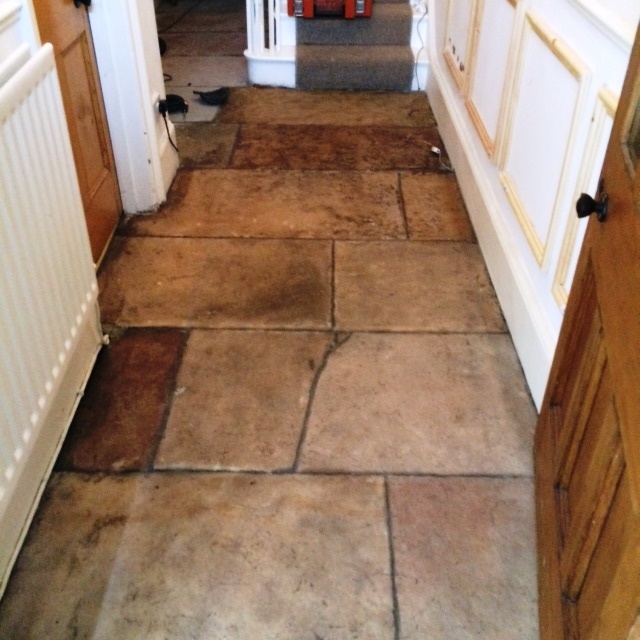 On my return I used a damp tester to make sure the floor was dry, which it was, so I sealed it with two coats of Tile Doctor Colour Grow which is a as well as protecting the floor brings the natural colours out in the tile. Naturally if the damp tester had showed that it was damp I would not have sealed the floor that day as the sealer would not have taken properly. This job took me one day as it was only a very small floor and I was able to seal it in the same day the customer were happy with the result I went through the maintenance program and explained how to clean the floor. 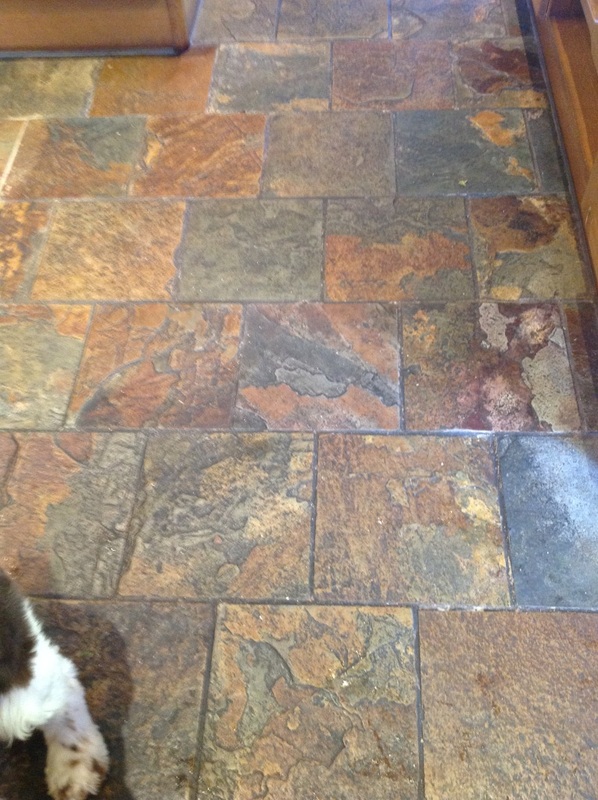 A Kendal Tiles customer from Windermere called me in to take a look at their Multi Coloured Chinese Slate tiled kitchen floor which was looking very dirty with ingrained stains and marks on the stone from spills etc. that were proving difficult for the customer to clean. 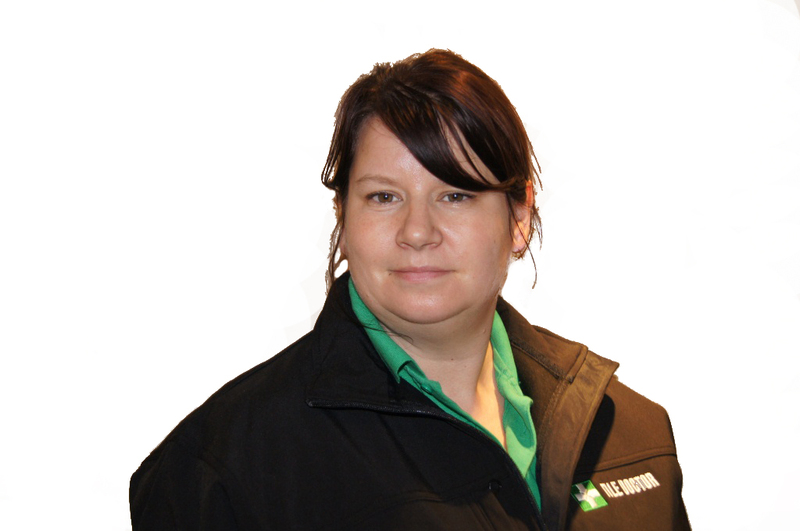 The brief was to give the floor a deep clean, remove the stains and make it easier for them to maintain thereafter. 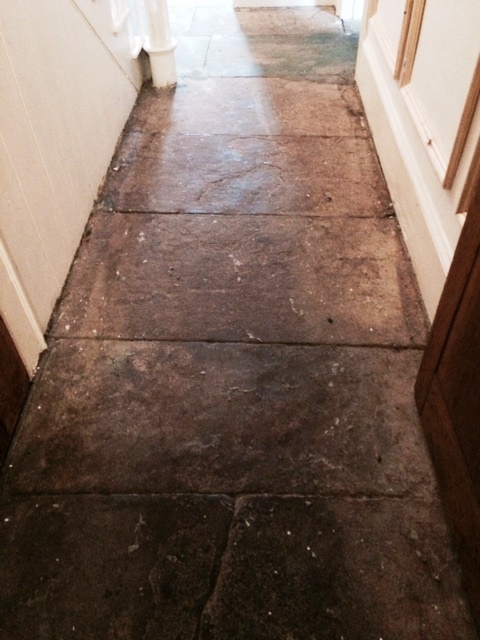 On inspection I could see the sealer had broken down, which is why the slate was getting stained and hard to clean. I did a test area on the slate and grout to show them how it could look and it came up really well so the signed my Work survey form and booked me in to do the work. On my arrival I covered the wood and carpet in the kitchen and hallway to protect it then started on removing what was left of the old sealer with Tile Doctor Remove and Go; I sprayed it on working in small areas and activated it with a brush making sure I scrubbed well around the areas of slate that are risen as in this slate its uneven and then washed it off using a wet vacuum to remove the soiled solution. 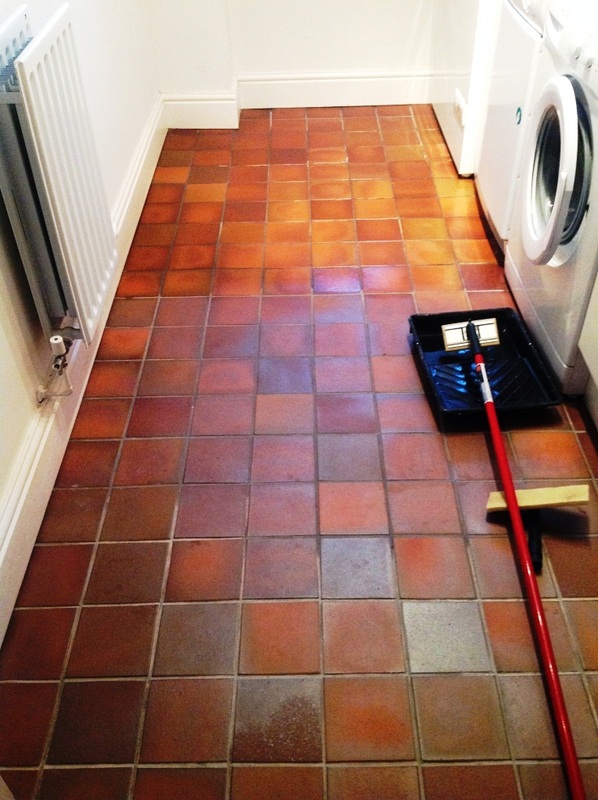 It was very satisfying to watch the tiles come back to life with bright colours, I kept at it all day until all the Slate tiles were clean and the sealer was fully removed, I then scrubbed all the grout joints to make sure they were all clean then I washed all the floor down before I left ready for sealing the next day. The next day I sealed the floor with Tile Doctor Seal and Go to protect and enhance the tile putting on five coats before it was fully sealed. I used an industrial air blower to help it dry quicker as the house owner had a dog and I did not want any paw prints in my work. Below is a photograph of the end results in which you can see the natural colours have come back to life. This job took me two days and the owner was extremely happy with the result, I also spent time to explain a maintenance program discussing how to clean the floor with Tile Doctor Neutral Tile Cleaner which has a low PH and not an off the shelf supermarket cleaner which being mildly acidic can break down the sealer and reduce its life. 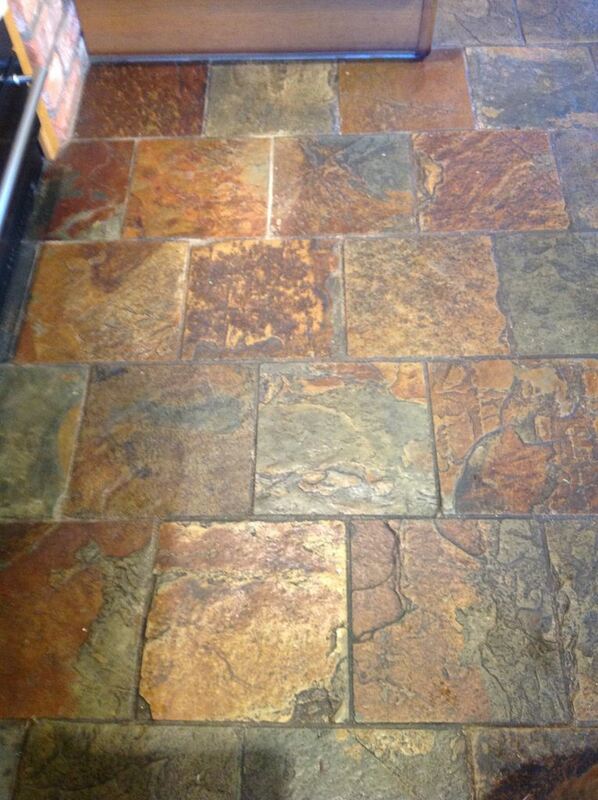 To Buy These Multi Coloured Chinese Slate tiles contact Kendal Tile and Stone. 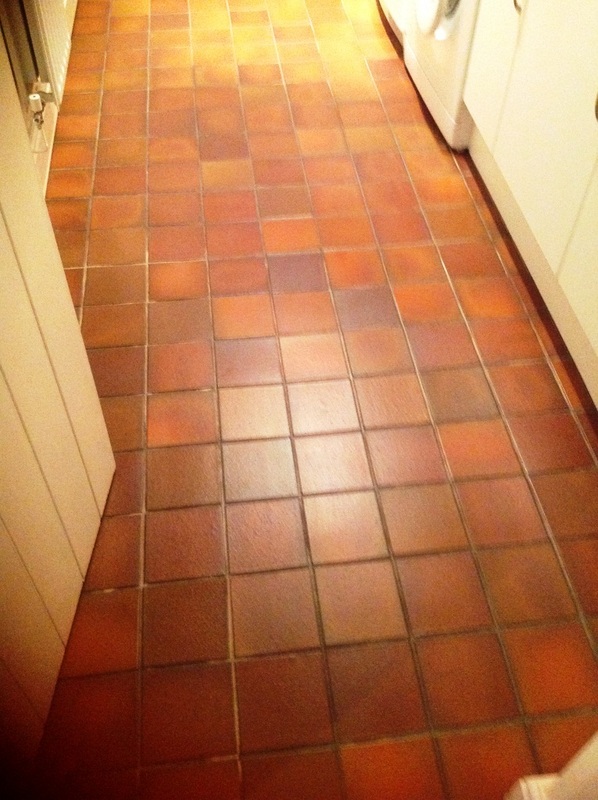 A customer in Kendal requested that the colour of grout installed on 20m2 newly laid textured Porcelain tile floor was changed; the tiler had used a Sandstone coloured grout and they were not happy with the colour or the grouting in general which looked patchy. 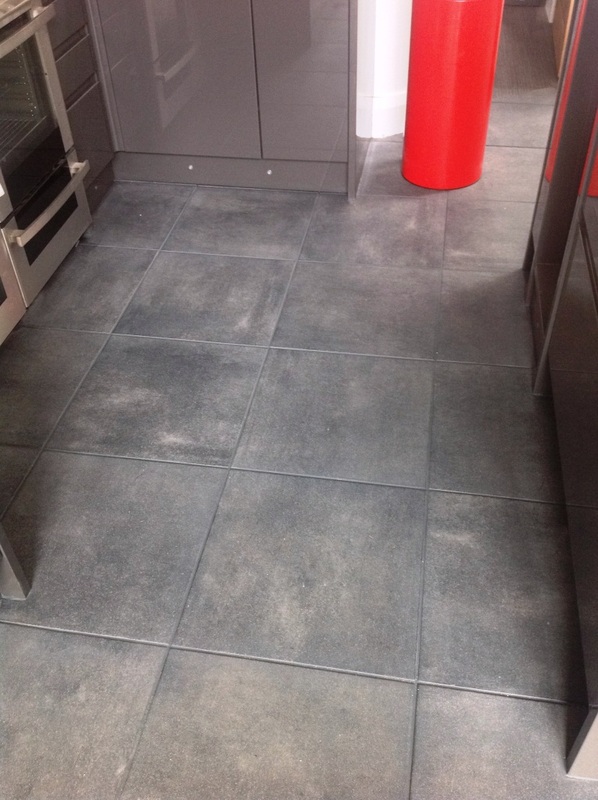 I recommended the use of an epoxy Grout Colouring product that re-colours, seals and rejuvenates existing grout joints and comes in twelve different colours and after showing the customer the different colour options they picked Charcoal Grey. I did a test area so they could see how it might look under the lights which went well and so I started to apply the grout colouring to the whole kitchen floor completing small areas until the entire floor was covered and taking care not to get any on the Porcelain tile as the textured surface makes it difficult to remove and requires the use of an white abrasive scouring pad. Normally you have to use a Pre-Treater product on the grout before Grout Colouring however this grout was new and so this step was unnecessary. This job took me one day and only required one tube of Grout Colourant. 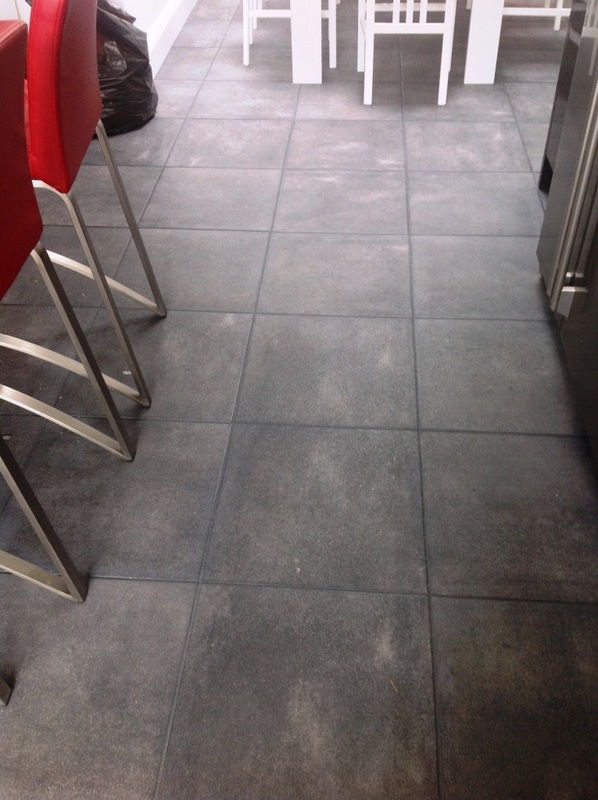 The owner was extremely happy with the result will now have a fairly maintenance free tiled floor as Porcelain tiles are very hard wearing and the epoxy grout colourant acts as a barrier and therefore unlikely to discolour.